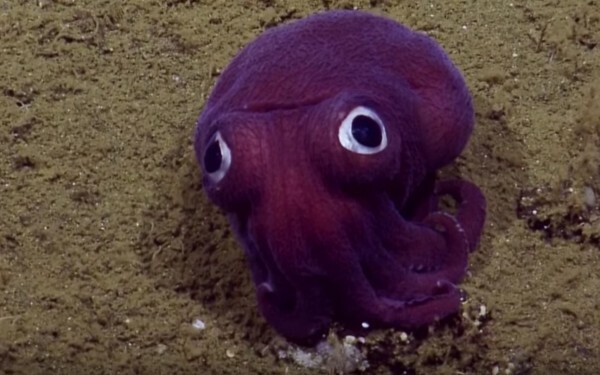 Have you ever heard of a "googly-eyed, stubby squid?" Well, you have now. You can see the excitement in a video posted to YouTube. It has more than one million views. You can hear the scientists saying "Whoa! What is that? He has weird eyes." The scientists are laughing. One of them jokingly suggests that the squid is actually a child's toy dropped into the ocean by accident. If we did, we would fail or go crazy for sure. Our oceangoing ship is ploughing across the Pacific Ocean. I've mainly searched for fossils and deep sea creatures. Google is confident their new mapping project is within the law. 1.The small sea creature was found at a depth of about 900 meters, off the coast of southern California. 2.The Nautilus has remote-controlled roving vehicles that can explore the ocean floor. They bottomed a submarine on the ocean floor.